The kettlebell renegade row is an advanced exercise that will work deep into the back while at the same time conditioning the core muscles. 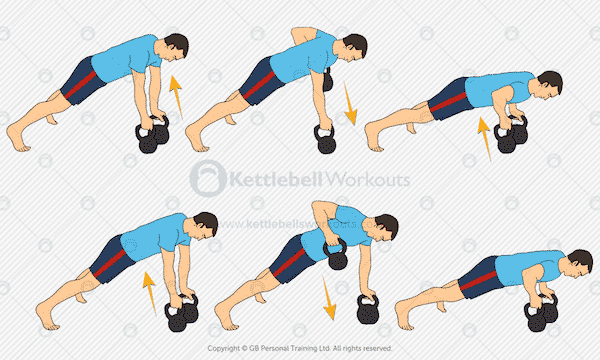 Kettlebell training offers very little horizontal rowing movements to counterbalance all the pushing exercises so becoming familiar with the renegade row is well worth your effort. There are many variations of the renegade row and using the correct progressions will ensure that you do not compromise the movement and achieve the best results possible. The kettlebell renegade row is an important exercise to master because it is unlike any other kettlebell exercise and vital for balancing out the body. What Muscles does the Kettlebell Renegade Row Work? The kettlebell renegade row is a full body exercise that develops both strength for moving heavy loads while at the same time conditioning the core muscles for safer movements. 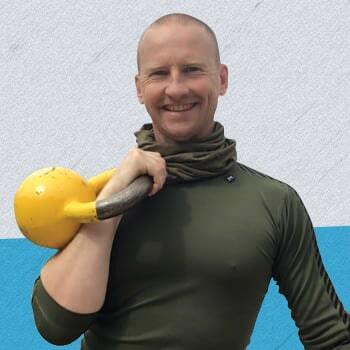 The kettlebell renegade row is predominantly a horizontal pulling exercise but also includes horizontal stabilisation and can include horizontal pushing too. The kettlebell renegade row is performed from a plank based position with both hands on the kettlebell handle. The body needs to be kept tight and in straight alignment from the shoulders down to the heels. It is vital that the hips are not allowed to drop down towards the floor thus putting adding pressure on the lower back. From the static plank position row the kettlebell back and towards the hip, pulling from the elbow NOT the hand. The shoulders should be kept away from the ears so all the muscle activation is directed into the mid back rather than the upper back and neck muscles. Keep the rowing action slow and deliberate pausing at the top of the movement before lowering the kettlebell back down towards the floor slowly. Warning: bad rowing technique or unstable kettlebells can lead to the kettlebell falling over sideways and trapping the fingers. If you are worried about the kettlebells falling over then please use only one kettlebell as detailed below. The kettlebell renegade row is an advanced exercise with a lot of moving parts and things to think about. Good core strength is necessary just to hold the basic starting position. I encourage everyone to work through the following progressions in order to prevent injury and better condition yourself. The kettlebell renegade row starts by holding the plank in the top position on the hands. You need to develop your strength in this top position in order to better cope with the addition of a kettlebell. If you can’t hold this plank position for at least 30 seconds then your kettlebell renegade rows are going to get ugly. The shoulder tap exercise (see image above) is the perfect way to develop the stabilisation core strength necessary. First begin in the top push up position and squeeze your buttocks tight. Keep your core muscles braced and maintain a straight line from shoulders to heels. Step 1: Maintain the top position without your hips falling towards the floor for 30 seconds. Step 2: Progress to lifting alternate hands up slowly and touching the opposite shoulder. Step 3: Perform 60 seconds of shoulder taps keeping your body in a perfect straight line. Once you are solid and stable in the top push up plank position, as detailed above, then you can progress to adding one kettlebell. 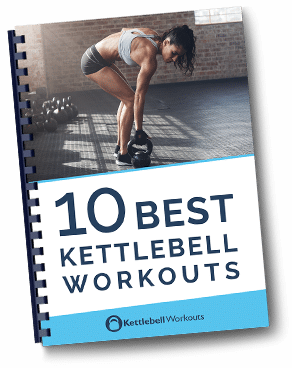 For this renegade row variation place one hand on a box, bench or parallette and the other on top of the kettlebell handle. As a beginner your feet should be shoulder width apart, as you become stronger you can reduce the space in between your feet. Brace your abs, squeeze your buttocks tight and row the kettlebell back towards your hip. Pull the kettlebell up by using your elbow rather than your hand. At the top of the movement squeeze your shoulder blades together and pause for 2 seconds. Slowly lower the kettlebell back down towards the floor. Practice: work up to 8 controlled repetitions before changing sides. The kettlebell renegade row with two kettlebells allows you to work alternate arms or one arm at a time. Once you have mastered the renegade row with one arm this exercise is the next progression. Your technique and foot position is exactly the same as with the one arm renegade row. Most importantly keep your core tight so your hips do not drop towards the floor and aggravate your lower back. Keep your shoulders away from your ears and neck muscles relaxed. Warning: during this exercise it is easy for the kettlebell to fall sideways and crush your fingers, especially when you start to fatigue. Practice: master rowing 5 – 8 reps with one arm before changing to the other side, once you are comfortable practice alternating sides. Kettlebell walking renegade rows are a more challenging variation of the standard kettlebell renegade row mentioned above. This exercise variation is great for further developing the core muscles as they stabilise during movement. The walking renegade row is performed in exactly the same way as the regular renegade row except the kettlebell is placed down in front of where you lifted it up from. 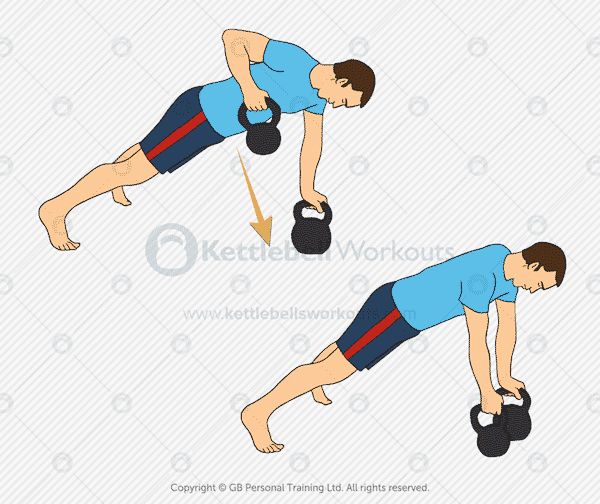 You will need to alternate arms as you row the kettlebell up, each time placing the kettlebell back down slightly in front of its original position. As you place each kettlebell down move the foot on the same side forwards to maintain good balance. Don’t make the mistake of trying to move each kettlebell too far forwards, 3 to 6 inches is enough. Keep your core muscles tight and don’t let your hips drop towards the floor. Variations: kettlebell walking renegade rows can be performed forwards, backwards and sideways. The kettlebell renegade row with push up allows you to balance out the pulling movement of the row with the pushing movement of the push up. It goes without saying that you must first master the regular renegade row variation listed above before attempting this variation. You will need good shoulder stability in order to maintain good alignment above the kettlebells. Poor body alignment can result in one of the kettlebells falling sideways and trapping your fingers. The kettlebell renegade row with push up is performed in two parts, first you row and second you perform the push up. Keep your core muscles tight and body in a straight line in order to stay balanced over the top of the kettlebells. Move slowly and with control during the exercise. Variations: depending on your strength and experience you can either perform a push up after each row or perform one row on each side. The kettlebell renegade row is not an easy exercise, not only do you need the strength to row the kettlebell up but you also need the core stabilisation strength to maintain good alignment. The heavier the kettlebell you use the more you challenge your rowing strength but also your core stabilisation strength. So although you may be strong in the rowing movement pattern you may not have the core stabilisation strength to match. My advice, as with all exercises, is to start off lighter than you think and master the movements first. For example an athletic male with experience could start with a 12kg – 16kg (35lbs) and females an 8kg (17lbs) kettlebell. The kettlebell renegade row can be used in a number of different workouts depending on your goals. The kettlebell renegade row is an advanced kettlebell exercise that activates the back muscles as well as the core. Beginners should start by mastering the stabilisation strength that is needed to hold the body in a straight line. Above I have listed 5 variations and progressions of the renegade row: shoulders taps, one handed rows, two handed rows, walking rows and the renegade row with push up. To achieve a safe and effective kettlebell renegade row work your way through all 5 exercise progressions. Be careful when performing the kettlebell renegade row with two hands that the kettlebells don’t tip over sideways and trap your fingers. Take care and enjoy your training.